Early Americans learned the use of Blue Cohosh from the Native Americans, also called blue ginseng, squaw root, or papoose root, it is used primarily for gynecologic conditions. In fact, many Native American tribes used strong root decoctions of Blue Cohosh for preventing conception, though herbalists no longer recommend this practice, because the herb is unreliable for this purpose. Blue Cohosh is a reliable remedy that has been used to stimulate menstrual flow, to induce labor, and for rheumatism, cramps, and epilepsy. It has also been used in formulas to treat endometriosis, Chlamydia, to help pelvic inflammatory disease (PID), Polycystic Ovary Syndrome (PCOS), ovarian neuralgia and retained placenta and cervical dysplasia. With all the current news about Black Cohosh for use in menopause, the herb Blue Cohosh has been almost overlooked. The properties of Blue Cohosh make it the perfect herb to use during the childbearing years. Blue Cohosh is an important "women's herb" introduced to early American settlers by Native Americans to ease childbirth, menstrual problems, and pelvic inflammation. As a uterine tonic, it has been used to nourish and revitalize the uterine tissue in a variety of circumstances, including pregnancy, miscarriage, abortion or when coming off birth control pills. It can be a jumpstart for delayed periods or for those that are abnormally light. Additionally, it is used to treat weak, worn-out or sluggish uterine muscles, which is indicated by cramps or no cramps, but prolonged bleeding, weak pelvic, abdominal and thigh muscles. Caution: Blue Cohosh contains at least two uterine contracting substances, which are unique to this herb. It is also an estrogenic herb which can have estrogen-like side effects, so those with estrogen-dependent tumors should not use this herb. Blue Cohosh, as an effective diuretic, can induce and increase the flow of urine and will help eliminate excess water in the system. Blue Cohosh also may be useful in cases of breast tenderness and abdominal pain caused by fluid retention. It contains immune stimulating and antibiotic properties and has been useful in the treatment of bladder and kidney related infections. As a weak diaphoretic, an agent that promotes heavy perspiration, it may be helpful in the elimination of toxins through the skin. The extract of Blue Cohosh has been used for colds, viruses and other illnesses accompanied by high fevers. In use, it is preferable to other treatments, where delay results in debility, fatigue or nervous energy. The herb has anti-microbial and anti-inflammatory properties, which may help to reduce swollen infection in the throat. As a mild expectorant, Blue Cohosh is still used today by herbalists to reduce congestion in the lungs, and helpful for conditions such as bronchitis. Blue Cohosh has anti-spasmodic properties enable it to be used in some cases of asthma, hiccups, colic and nervous coughs. Due to its anti-rheumatic and anti-spasmodic properties, it has been used for muscle spasms, muscle cramps, and to reduce the pain of rheumatoid arthritis. 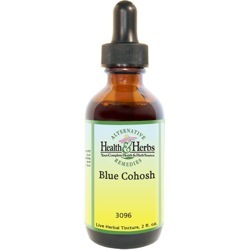 Blue Cohosh is very beneficial for inflammation and congestion of a chronic nature, such as arthritis. It has been shown to be helpful to those who are bothered by arthritis or joint pain that occurs in the fingers or toes when these joints are first used, and then gets better with ongoing movement. Blue Cohosh was used to ease indigestion, treat flatulence, and gastrointestinal cramping, gallstones, and as a general purpose tonic for fever. An old use for Blue Cohosh was for an herbal medicine that would destroy or expel worms and parasites from the gastrointestinal system. Ingredients: Blue Cohosh, Structured Water, 20% Alcohol. Non-Alcohol: Blue Cohosh, Structured Water, Vegetable Glycerin. All of our ingredients are Certified Organic, Kosher, or Responsibly Wildcrafted. No genetically modified organisms (GMO's) are involved. All other products that are distributed by us meet high-quality standards. Contraindications: Blue Cohosh Herbal Supplement should be used with caution; it can be quite irritating to the mucous membranes and should be used only under the supervision of a physician. Nursing mothers and children should not take Blue Cohosh. Pregnant women should not use this herb, as it can stimulate uterine contractions. Blue Cohosh should not be taken for an indefinite period of time (a week at a time is recommended) and should be avoided by patients with hypertension and heart disease or are taking heart disease medications, such as Lanoxin, digoxin, Cardizem, Dilacor, diltiazem, Calan, Isoptin, and verapamil.